You have to ask yourself an obvious question first: what are you trying to achieve by using face detection in Picasa? Face detection makes sense when you want to identify faces in a photo. You simply want to say who it is in the picture. In addition, you would want to preserve this identification in the image metadata. This way you can search for pictures containing your cousin Mike for example. It is obvious that if you take landscape photos you would not need to use face detection on them. You would use face detection in Picasa for two things: to identify people and save this information in the picture file as metadata. The main advantage of using face detection in Picasa is that, once trained, the face detection algorithm in Picasa works very well. It is actually awesome! Notice the words…once trained. The biggest drawback is that Picasa face recognition needs to be trained. At first it will be overwhelming, so you might want to start with only a couple of folders and see how it goes. The second drawback is that Picasa will find a face even if that face is way off in the background somewhere. And as far as automatically creating keywords with your people tags, you can just as easily use keywords for the people in your pictures rather than relying on Picasa’s algorithm to find them. This feature might seem very cool to use at first but may not work well for you. So, before you jump in make sure you think about your goals. If you have decided to give face detection a try, then read on to see how to use face detection in Picasa. Enable face detection = this will turn face detection ON or OFF. This setting applies only to the folders where you have enabled face detection. Enable suggestions = This is useful when training the face detection algorithm. The default value is usually fine. Store name tags in photos = if you use face detection you should check this checkbox. This will save all the name tags to your image metadata which is one of the main reasons to turn on face detection in the first place. Setting Picasa options for name tags. 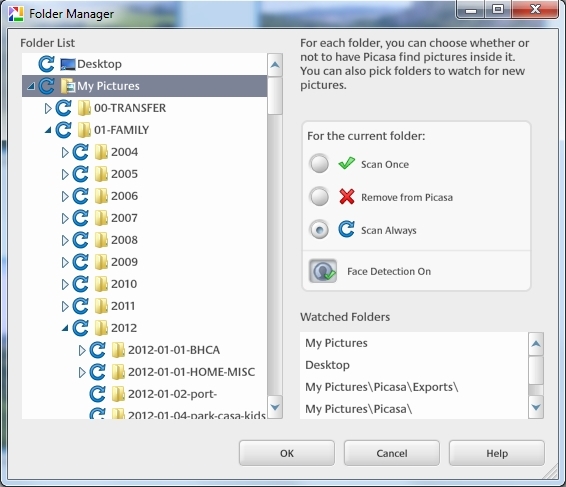 To turn face detection on or off in Picasa, you need to use the Folder Manager function. For this you need to go to File --> Add Folder to Picasa. This will bring up the Folder Manager window. To turn on face detection on a folder it’s a bit trickier than it seems. If a folder has face detection turned OFF, then you will not be able to turn face detection ON for ANY of this folder’s sub-folder. This means that you first have to turn ON face detection in the parent folder of the folder you’re interested in. 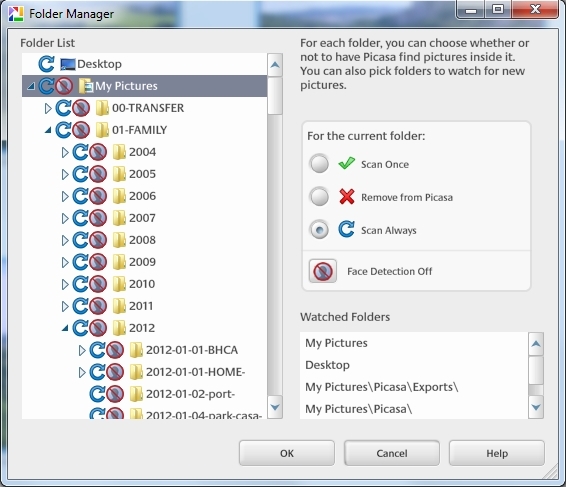 Use Picasa Folder Manager to turn face detection on. For example, if I only want to turn face detection only for 2012-01-01-HOME-MISC, then I need to enable face detection all the way up at the My Pictures folder level and turn OFF face detection for all the other folders except the one I am interested in. Turning Face Detection OFF in Picasa is easy. Using the Folder Manager, you just select the folder you’re interested in and press the Folder Detection button. When a folder has face detection OFF it will look like the picture below. 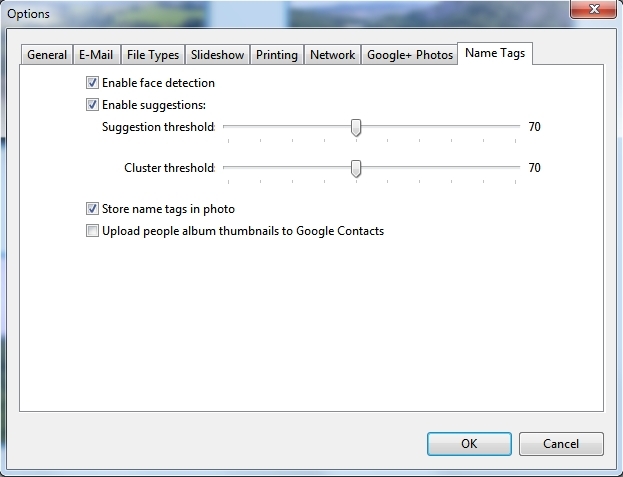 Use Picasa Folder Manager to turn face detection off. Should you use face detection in Picasa? Then answer really depends on you. If you want Picasa to run as fast as it can then you should NOT use face detection (Read 3 ways to speed up Picasa). Or you can be selective on which folders you turn face detection on. However, face detection can be very useful once trained because it identifies faces in pictures and creates keywords that get saved to those pictures. 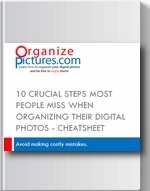 This is very useful for creating a meaningful image context for your digital photos. I do not know of an automatic way to email based on face tags. However, Picasa does group people into albums under the people section. I prefer Picasa over Windows Photo Gallery, because Picasa can write tags on the actual file, not in separate file, therefore using less disk spaces! Has anyone else had this problem with Picasa? I started to identify faces on Picasa, and then after I did a couple hundred, it started recognizing them, and at least 90% of the faces were identified correctly. However, after I had identified several thousand faces, with several thousand to go, I restarted the application, it compacted the database, and now when I try to use the facial identification, it does not offer me any suggestions, or not the right suggestions, and I need to type in the first several letters of the person’s name to select them. Is this a known issue? Jeff…I have not noticed this problem. It looks like it doesn’t recognize faces automatically anymore…only manually. I think you have tried restarting Picasa…then make sure that in Folder Manager all your folders have face detection turned on. Also under Tools /options/name tags make sure Enable suggestions is checked. David….use Folder Manager under the tools menu. Add specific folders from the drive…then you should be able to turn on face detection on those folders. Kristi…it all depends on what folders you added in Folder Manager under the tools menu. If you have a lot of photos and have face detection turned on for all of them…then what you see is correct. 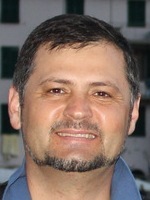 You wrote a good article about Picasa and their face recognition feature. Do you have any tips on how to share that digital file of many pictures with face recognition with other friends? I’ve uploaded to Picasa Web Albums and the face recognition goes there, but how do I share the PWA file without giving others my google user name and password? Face recognition metadata is saved in the image file itself (if it is a jpeg file). See my article about Picasa metadata. You should be able to just share the image itself and face detection information should be in it. If you want to share on Google Plus I believe the others have to have an account.